A road sign just to north of the old military base at RAF Saxa Vord near Haroldswick directs visitors towards "Britain's Most Northerly Church". Following the sign takes you past a small housing development and up to the square grey-harled church complete with its red aluminium roof and tiny spire. The church was needed because its predecessor, which used to stand where the car park is today, was badly damaged by high winds. 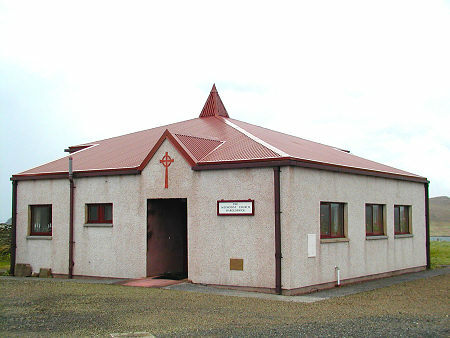 The foundation stone was laid in 1990 and the church was dedicated in May 1993. 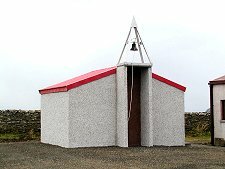 It was designed by the Shetland architect Frank A Robertson and built along the lines of a simplified Norwegian wooden staved church. Perhaps the most striking external feature is the separate bell turret, built as a millennium project in 2001 to house the bell, which dates back to 1867. 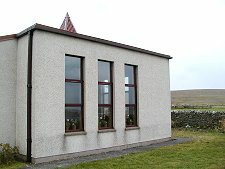 The sides of the church visible as you approach are plain and simple, with small windows. So what you find inside is a surprise. Beyond the door you cross a corridor serving a number of smaller rooms lining the north and west sides of the building, before entering the main hall. This is breathtaking, lined throughout with Scandinavian red pine panelling. The result is a really attractive space with a warm, light and airy feel, even on the most grey and uninspiring of days. 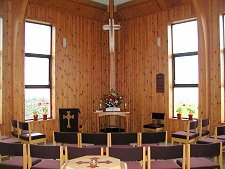 At the far corner of the church is its main focus, a communion table with a cross hanging from the wall above. 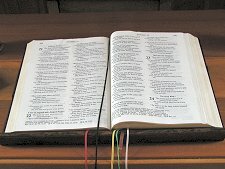 The table, and the lectern that stands nearby, include wood originally used in the pulpit of the earlier church. 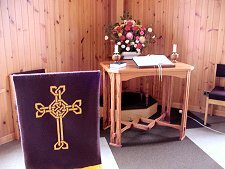 The design of the lectern cloth comes from an old Shetland stone cross. The main structure is of laminated beams from Denmark. These meet at a wooden boss in the ceiling made by a local schoolboy. Their other ends are built into large concrete blocks. 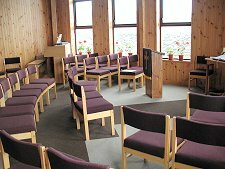 The aim is to ensure that this church is less prone to wind damage than its predecessor. The southern and eastern sides of the church, not visible as you approach, each carries a series of much larger windows. These allow fine distant views taking in the sea and parts of Unst. The views from the church are helped by the way the ground to the south has been gently built up to the level of the top of the stone field wall in that direction. The effect of this is to conceal the wall and improve the views further: a feature that in an English country house would be called a ha-ha. To the east the field wall is still visible, adorned by two small stone doves at its base. 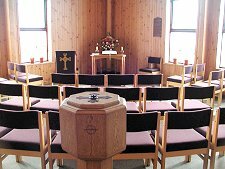 A visit to Haroldswick Methodist Church may be provoked by no more than a sense of curiosity, a side turn en route from Britain's most northerly brewery, Valhalla in Baltasound, to Britain's most northerly house and road at Skaw. But what you find, rather surprisingly, is a warm, welcoming and beautiful little church with a wonderful atmosphere. This is a small diversion well worth taking, and not just for those whose interest is in collecting "most northerlies".